Several months back I came across, THIS Asian coleslaw recipe, and I made it. I fell in loooooove with this recipe and so did my husband. Before I knew it, he was asking for it all the time. I wanted to post this recipe before Christmastime, but I thought to myself that it wasn't a very "Christmasy" recipe. Well what do you know? I made this on Christmas for lunch with my dad. Again, it was a BIG hit, and I thought, I just have to get this down. I have modified it from the original recipe to be a little easier for me and to incorporate things I have in my own pantry more often. For instance, I always seem to have powdered ginger, not fresh, so that is what I have used. Either way, if you make this slaw, you might never make slaw another way. It's just so good. Soooooo good. I like to serve mine with hot dogs, hamburgers, or just a good sandwich. Oh, and any kind of pulled pork, but especially this Korean BBQ we get form the store. It's heavenly! optional: a bunch of scallions, chopped. These taste amazing, but I forgot them. 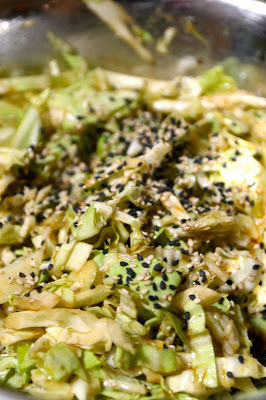 In a mixing bowl, combine all the ingredients and stir well, coating all the cabbage. That was ridiculously easy, right? I know.